A little STORY for ya…. At the summer camp there was a talent show, of course, I jumped at the chance to sing a song and show case my skills. There was a dance performed by a gorgeous young lady called Rachel who was 13. Rachel was stunning with long curly hair, had a beautiful smile and she was very popular with the boys, girls and staff…..basically everyone! As I observed her, I realized she didn’t only dance really well but, she could sing and was amazing at sports. She seemed to know everyone there and everyone seemed so happy to be in her presence. Rachel and I became really good friends that week, but deep down I was experiencing some strange emotions and I couldn’t shake this desire rising up in me, I wanted to be her. Somehow after seeing her talented dancing and all her other gifts, my singing talent seemed so small and insignificant. After I left camp I couldn’t stop thinking about how great I thought she was and how I wished I looked like her and quite simply was her. Around 6 months later, Rachel and I were having one of our phone conversations and I decided to tell her how amazing I thought she was, and that deep down I craved to be just like her. Rachel’s response blew me away, as she explained that she felt exactly the same way about me. While I was desiring to be like her she wanted to be me. Typical but to be honest, really quite sad. It makes me laugh now when I think about it because I am no longer that 12 year old girl, unsure about myself and desiring to be someone else. I love who I am and even though there are things about myself I would like to improve, I wouldn’t want to journey this life in anyone else’s skin. I have recognized my value, and refuse to devalue what I have just because someone else has a skill or talent I don’t obtain. I must be honest It’s something I still have to take control of in my mind, but I’m doing really well. What about you? How do you feel about yourself? When God created you He new what all your likes and dislikes would be, he thought it all through and He created you perfectly perfect! 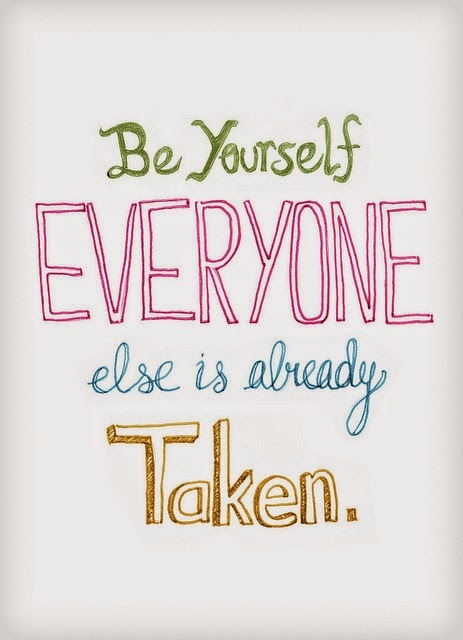 To sum things up, do YOU, be YOU, dress, walk, talk, and Look like YOU. You have just the correct amount of everything, and that my friends make you unique and special. Don’t waste 2015 wanting to exchange your life with another because you have your own story to write…..